Encourage your students to change the subject when they hear gossip. Gossip is a common problem in a school setting. 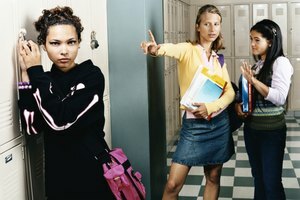 Students who are victims of gossip can feel alienated and lose focus on their studies. Activities that expose feelings and teach communication skills provide interpersonal understanding, teach sensitivity to others and bring a sense of team to a classroom. 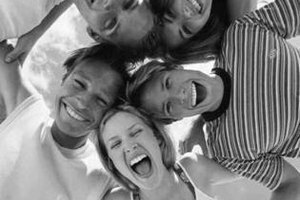 Use team-building activities at the beginning of the year to establish ground rules for classroom behavior that will set the tone for the entire school year. Help your students develop effective problem-solving skills so they can manage interpersonal conflict on their own. Divide the class into teams of six students and ask them to brainstorm a list of effective conflict-resolution strategies. Have each team read their list to the class and vote on the top five best practices. Next, pose a scenario to the class and ask them to select the best way to respond. For example, what would they do if they witnessed someone gossiping about a friend? Establishing guidelines for conflict resolution and providing an opportunity to apply the rules, will help solidify expectations for behavior. Knowing what others think of you can help shape behavior and also can influence the way you interact with others. Help your students gain a stronger sense of self and help them feel positively about their classmates with an activity using paper, tape and washable markers. Have each student write his name on a piece of paper and then ask someone to tape it onto that student's back. Ask each student to write something positive or intriguing on each piece of paper. After everyone has a full sheet of paper, have the students read the comments aloud to the class. Ask them how they felt about what was said and if anything surprised them. Underscore the importance of using positive comments, rather than negative comments, when speaking about others. It’s very challenging to take back a negative statement that’s made about another person. Help your students realize how words can affect others with an activity that uses a tube of toothpaste. Divide your class into small groups and give each team a small tube of toothpaste, a paper plate and a wet paper towel. Start the clock and tell the class that this activity is a race to see which team can empty the tube of toothpaste onto the plate as fast as possible. Next, give the class one minute to see which team can put all the toothpaste back into the tube. Your students will find that a toothpaste tube is a one-way vessel that allows toothpaste to escape, but that it doesn’t allow others to re-insert the toothpaste back into the tube. Hold a class in which you liken gossip to this activity. Emphasize that once you’ve spoken negatively about someone that it’s nearly impossible to take back your words. It’s easy for secondhand information to change and evolve as it’s shared by multiple people. Illustrate this by playing the old-fashioned game of telephone. Have your students sit in a circle. Whisper a phrase to one student and ask that student to share it with the person sitting to her left. Repeat the process until the last person has heard the phrase. Have that person say it aloud to the group. Compare the ending phrase with the original phrase you said to the first person, and discuss the differences. Liken this to how secretive stories can morph into untrue statements and ask your students to provide examples of real-life situations. Kelly, Dr.. "Team Building Activities for Teachers to Decrease Gossip." 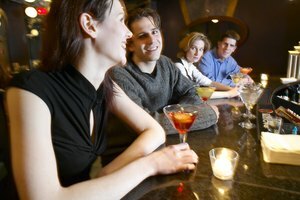 Synonym, https://classroom.synonym.com/team-building-activities-teachers-decrease-gossip-12026655.html. Accessed 24 April 2019.